You guys! Stuff is actually happening in our kitchen! Whaaaa?! Our initial grand plan was to be ‘finished’ our kitchen revamp before the end of April. Ummmm… Why do we do that? We know better. A project of this scale inevitably takes a whole whack of time. Because of this, we ended up changing our minds about a number of things as we moved forward. We are going to break this post into days and outline what we learned along the way, including what we did to ease the pain of painting our upper cabinets. Ready, set, go! Dan paints the ceiling. This is so straightforward, we didn’t take any pictures. We figure you guys don’t need to see Dan edging and rolling paint onto what is essentially an upside down wall, right? When covering up a COLOURED MURAL (our ceiling was sky blue with clouds painted on… ugh) you will need more paint than you think. We started out with a quart of SICO ceiling paint in un-tinted white. That would have been more than enough if we were painting white over white… but we weren’t. So we had to make an emergency run back to the hardware store to get another quart. Lesson learned. Ceiling painted. Dan and Erin disassemble and prime the upper cabinets! 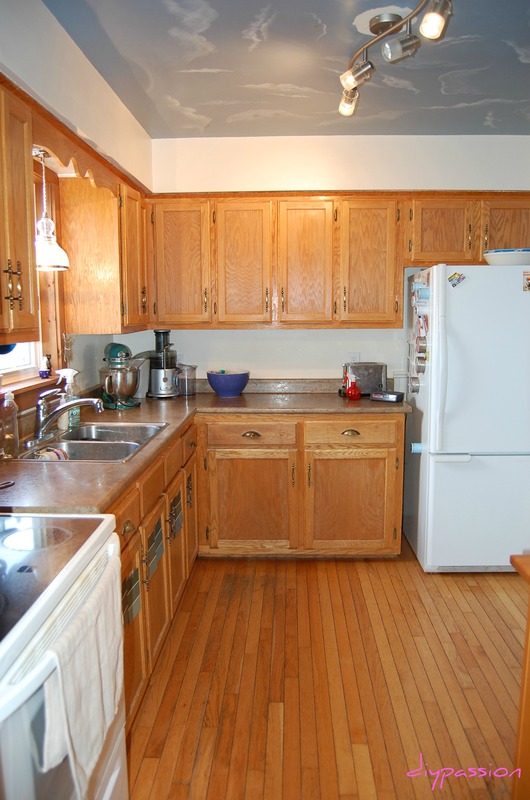 When we pulled down the two window-flanking cabinets, we learned something valuable – that the cabinet fronts detach from the cabinets themselves. We used this to our advantage and pulled them down so we could paint without having to tape or edge! WIN! It took us much longer to get started on painting than we thought. It was a full two hours to get all the upper doors down, remove the hinges and hardware, clean all the surfaces thoroughly with heavy-duty kitchen de-greaser (TSP), sand them down with a medium grit paper and then wipe them down with a clean damp cloth. We also did all the panel pieces at this point too. It took so long, it bored the dog. If you are doing this for your kitchen, the de-grease step is crucial. You really don’t want to lock all those unseen ‘yumpies and wuzzies’ into your new-to-you kitchen. The rag when we were done was DIS.GUS.TING. Even the insides of the doors were greasy. Who knew that regular kitchen cleaner doesn’t do it after a while?? It was SO much better having two counter height surfaces to work on. We draped my craft island in a drop sheet and then we also draped our washer and dryer (not ideal, but worked marvellously!) This meant little to no bending and saved our backs and hips!! If you can rig something up like this, do it. What a difference. Once we had that wrapped up, we used high-quality two-inch bristle brushes to apply Zinsser Bulls Eye Primer to everything – front and back. This stuff is great. It dries in about an hour which lets your projects proceed smoothly and without much interruption. Dan and Erin re-prime certain cabinet parts, paint, re-paint and re-hang the cabinet faces. Basically, because we were painting over honey maple cabinets, even with the strength of the primer, there was some visible yellowing coming through. That prompted us to do something unconventional: We primed the cabinet faces TWICE. Typically people would paint two coats instead of priming twice, but we wanted to make our paint work less. We applied the second coat of primer with a bristle brush and that took care of most of the yellowing. It also eliminated any need for further sanding! WIN! For the paint, we used high quality SICO paint designed for Cabintets & Furniture. For the colour, we chose our tried and true favourite: Igloo White. To apply the paint, we turned to the high- quality foam rollers and foam brushes. TREMENDOUS! Why have we never paid the extra $4 for these rollers before? They are from Home Depot. The kind that have the blue stripes and that offer a bit of a ‘higher plush’ look. WOW! What an amazing and noticeable difference in the finished product! Two coats of paint were applied to the cabinet fronts (on Day Three) and they looked like a mere shadow of their former selves. Love. Proper paint is key when doing a highly visible surface that requires durability and washability. We are very glad we bought speciality paint for this project. It definitely added to our timeline though. Drying time for this paint is at least 4 hours between coats. The more expensive foam rollers are worth their weight in gold. This day was pretty straight forward. The cabinets needed only a few minor touch-ups at this point. Now, we were planning to purchase new hardware, but enter in one of those ‘changes’ to our plan. We decided to up-cycle the current hardware, and save the cash. This hardware is heavy. It’s real metal and is likely far superior in quality to anything we’d want to purchase at this stage of our revamp. A little spray paint will go a long way to making these admittedly out-dated cabinet pulls work for us now. The last thing we had to do before putting the cabinets back together was patch all the holes left from when we re-hung the faces and the cover panels with our nail gun. Dan did this with some paintable wood putty and a foam brush. Easy peasy. Interesting to note, these photos were taken in the late afternoon, most of them with NO FLASH! In fact, the light is now so bright in here, some of these shots were over-exposed. What a difference some paint makes to the way a room feels. Also, Louie loves our kitchen mat. add some trim to the top of the cabinets to even out the edges and putty and patch those holes we cut in the bulkheads! move the fridge to the ‘other’ wall and get new counters to extend along this wall all the way to the wall. Also, try to say wall a fourth time in one sentence. Wall. find or build a new pantry system to literally hold all our rice and beans, (haha, I don’t know why that’s funny, but it is) and move this hutch into the craft room. ‘Cloudy’ kitchen needs some updating. This feels like the hardest and most gruelling project we’ve undertaken. Time for a cup of tea and a nap!! It’s looking fabulous! 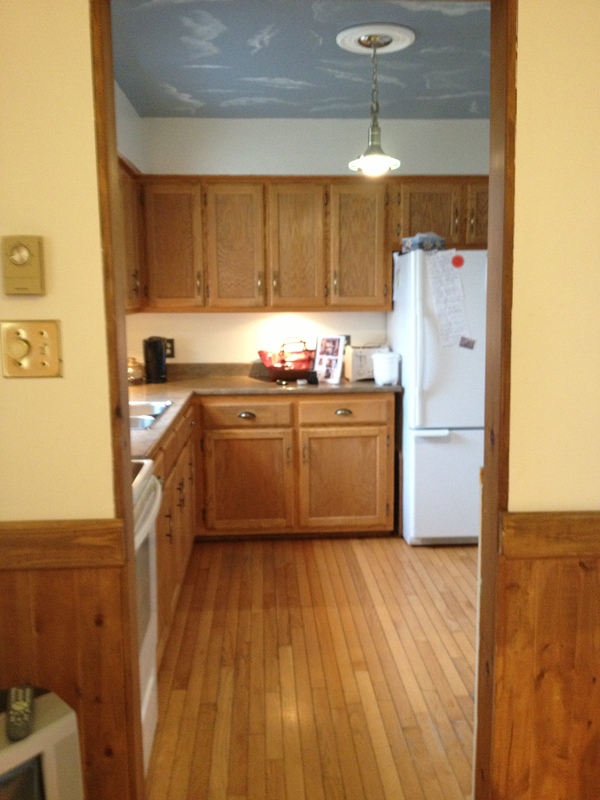 Love the cabinet transformation and can’t wait to see it all finished. Would love for you to stop by and share at Fridays Unfolded this week! Thanks for the invite Alison 🙂 We’ll definitely add you to our party circuit!